Have you ever played the game telephone? If you don’t know the game, it is when one person whispers a message to another, which is passed through a line of people until the last player announces the message to the entire group. If you have, then I am sure you discovered that it is almost impossible to keep the story intact from beginning to end. The game is an interesting teaching tool, as it shows children (and adults) how easily and unreliably gossip can spread. As a historian and genealogist, I often reminisce about the telephone game, because it was my first encounter with record assessment. Even as a young child, it was clear to me that the closer one was to the original source, the more reliable the information. And, as I grew up and began working with historical documents, this lesson continued. As a genealogist on the reference desk at NEHGS, and now as Director of Research Services, I always recommend researching with an original record. Never accept transcriptions as an acceptable resource, as the original is always better. Additionally, it is important to know whether you are looking at the original record, or a copy of the original. Yes, some records that look original are actually copies: vital records, deeds, and probate and census records, to name a few. 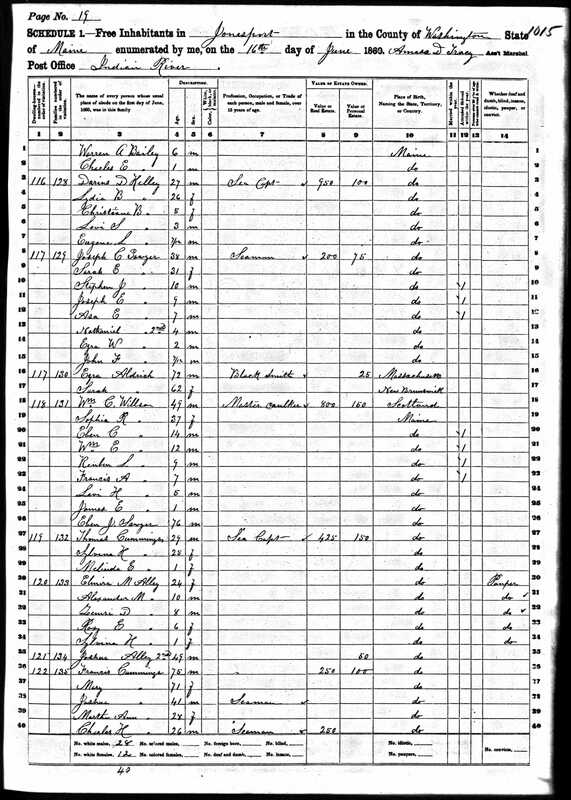 From 1790 to 1880, the United States Federal Census was copied, either two or three times, and filed once in its respective county and second on the federal level. 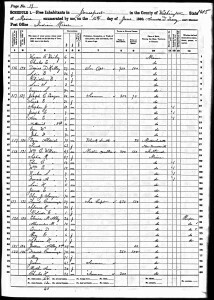 As a result, the census records that you see today, either on microfilm at the National Archives or digitally on Ancestry.com, are the census sheets that were forwarded along to the federal government. These federal records may be the original enumerations, or one of the copies made. Generally it is impossible to tell whether the federal copy is an original or a copy, but in some cases it is possible to note the differences. The first, and most obvious, is to note the order in which names are listed. If names are in alphabetical order, or grouped by the first letter of surname, then it is safe to say that the enumeration is a copy of the original. I’ve seen this most often with the earlier censuses (1790–1820), as census enumerators were required to hang two copies of the census in “two of the most public places” so the public could check for accuracy. Later censuses (1830–1880) were copied by someone other than the original enumerator. Therefore, to assess whether the federal copy was an original or a copy, look at the census returns for the whole county. If the handwriting is the same for each town, then it is probable that you are looking at a copy. Find the original, either at the county level or on microfilm. For example, some county copies of the United States Federal Census have been microfilmed by the Family History Library. If you are able to locate the county copies, you can the compare them to the federal records. Generally speaking, the original enumerations will have additional information compared to the federal copy. Robert M. Alley appears at Line 30. Elvira M. Alley is at Line 30. Note that the county copy (above) included the name of Robert M. Alley, with the notation “omit–prisoner”; the Federal copy (below) drops Robert altogether. In this case the original record provided more information than the federal copy. Therefore, it is essential, when working with any record, for researchers to seek out an original. Like the game of telephone, the original source will always provide more accurate information than the repeated version. If you would like to know more about the hidden gems of the US Federal Census, please see my webinar. Poor Elvira. With only the copied census, we may have assumed her husband was deceased. The husband was likely counted at the prison. That census is most likely available, if one knows the name of that institution in that area at that time. He would be listed as “inmate”, as were persons in asylums or in orphanages. THANKS! I never knew this!!! Thank you for this information. I would like to also add, check who supplied the information and when. My great grandfather’s birth certificate was recorded by the midwife a month after his birth . At the time of his birth, my great great parents had not yet chosen a first name for him, therefore the midwife did not remember the birth that well. She recorded him as female, though the rest of the information was correct. Latter guardianship records confirmed that the record was indeed his and not another child. Your experience underscores the importance of documenting siblings as well as direct line ancestors, and of conducting a “reasonably exhaustive search” for evidence. Another example is the NYC birth certificate I found in which the midwife had transposed the father’s and son’s names. Birth certificates for siblings, census enumerations, and other records did not continue the error and did show the proper relationships. Who would have thought? Yikes! Thank you for such an informative post, I never realized there were local copies (or originals) of census documents. Do you have any sense of the extent to which these local copies may still exist, and where they might be housed, e.g., libraries, or by county government? I understood that the 1890 census had been lost to fire, but if so that must apply only to the federal copy. Might local copies still exist? Lindsay, how does this apply to the 1890 Federal Census? We used to be told that virtually all of the paperwork for that census was lost in a fire in a central repository in Washington DC. But I notice you write ¨later censuses (1820-1880) were copied ….¨ What about 1890? Are there copies at the county level? The 1890 census was the first census in which copies were not made- only the original, which was sent to Washington DC for processing. It was also the first census to be tabulated by machine. As with other censuses, the originals were then stored. As I understand it, when the 1921 fire occured, most of the damage was due to water and smoke. A portion of the records were potentially salvagable, but Congress, probably because of the shaky economy of the time, did not feel it prudent to spend the money, and some years later ordered the damaged records destroyed. Archivists no doubt cried. Some records do remain, and some states made various efforts to replace at least some information contained in the census records. As for the other censuses, some states now have images of their copies online, and others have them on film. I learned this quite by accident, when I was doing research in a state (can’t remember which now) with census records online, and I realized that the ones for the county my family lived in looked different from the ones I had. It gave me information not on the federal copy. Cool. I used It to train new Army officers the importance of repeating exactly what they were told when repeating information they heard for the aiming of artillery (cannons) to fire upon the enemy and not hit our guys. I had them in a circle, facing outward. I whispered to the first one, “The moon is made of green cheese.” The message went around the circle, and at the end I had the officer repeat to the group what he had received. “NASA is planning a mission to the Moon to determine if it has Green Cheese or not on it.” Then, I had the original message revealed. They got the message. I’m also wondering if the surname might have been McCauley or variation. It all depends on what the enumerator heard and what he wrote and then how the person who copied it read it. It would be interesting to see how Joshua Alley 1st was spelled to see if it matched Joshua Alley 2nd. On the other hand, when I asked to see the birth record for my grandmother in the small Vt town, Dummerston, where she was born, it was entered as “Elise” rather than “Elsie”! The name on the censuses looks like “Elmira” to me, not “Elvira” as the caption states. Poor lady, husband in prison, four kids 10 and under and her name mistranscribed. Yes, I think you are right – Elmira, not Elvira. BTW, I highly recommend watching Lindsay’s webinar on reading and interpreting censuses (she put the link at the bottom of her post). It is well worth watching and even re-watching. I learned some things that are sending me back to take another look. There is more information than you’d think, once you learn how to look for it!